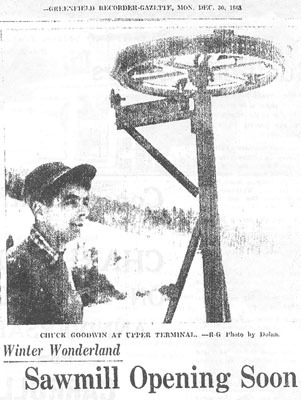 Sawmill Hill was a totally unique ski area...likely the only one ever built that utilized steam power to drive the lifts! But before diving into its interesting history, I must first thank Nan Williams. She contacted the former owner and friend of hers, Charles Goodwin, asking for information about the area. In return, he sent her some articles on the ski area, which she has sent to NELSAP. These articles are invaluable and greatly appreciated! Jeremy Clark from Berkshire East also first allerted us to the area. Sawmill Hill actually may have begun as the Blunder Mountain Rope Tow for kids on Warfield Hill in Charlemont, possibly in the early 60s. But the real history of the area goes back to 1963, when Charles Goodwin and his stepfather Fred Carroll decided to build the area. The two were partners in the Carroll Lumber Company, operating of the last remaining steam powered mills in Massachusetts in 1963. The area was built totally from hand, including most of the lift. Goodwin assembled or built every thing from the driving mechanism to the towers and cable. The only parts that were not his own were the grips and hangars, which came from the Mueller Lift Company (still several Mueller lifts in operation, one being a Mueller Double at nearby Berkshire East). The upper terminal (built by Goodwin). Picture from the Greenfield Recorder Gazette, provided to Nan Williams by Goodwin himself. 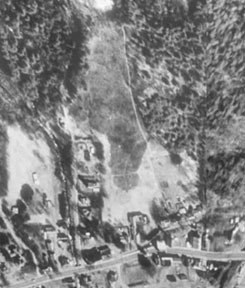 The area opened in early January, 1964. Here is the headlines of the paper right before it opened. Notice how the sign is in a fashion similar to a saw. 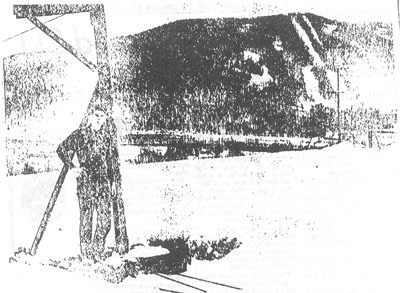 The area operated with a 1200' T-bar (shown here), with a 800' slope and a 1600' trail. 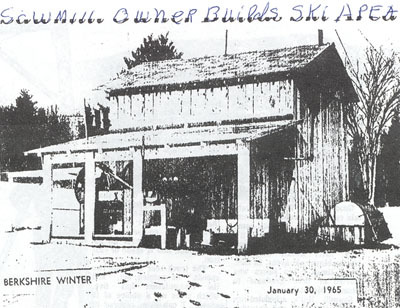 A 24 by 44 foot warming hut with kitchen and bathrooms also was available, and was totally built by Goodwin. This picture shows the T-bar, with Thunder Mtn (now Berkshire East) in the background. Thunder wasn't competition to the area---Sawmill prided itself as an affordable family area. Here's the building which housed the drive mechanism for the lift. 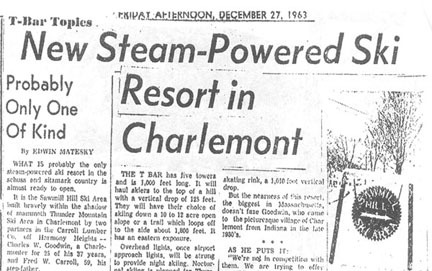 The area operated mainly weekends, and did offer night skiing, with lights that used to be used at an airport! Lift tickets sold for $2.50/day and $1.75/half day. This compared to typical prices of 5 to 7 dollars at that time. Although I don't know the exact reason for it closed, a lack of snowmaking or perhaps nearby competition made it close, likely around 1967-1970. But Goodwin wasn't finished yet. 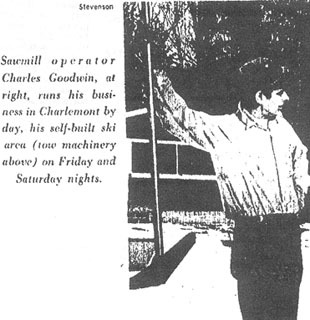 During perhaps the operation of Sawmill Hill, Goodwin invented the Turf Ski. This allowed skiers to enjoy the slopes in the summer, using rollers on the bottom of skis. I believe this was put in eventually at Mt. Whittier before they closed (but called T-ski then). An amazing invention for this small area. Today, the area has grown up considerably. Here's where I believe the area exists (from Terraserver). It is located on Warfield Hill essentially in the center of town. According to Charles Goodwin, the base lodge is a home and the lift building is a storage shed, and the area appears as a "Bavarian Forest."